My name is Mark, Parisian, Franco-British, I started to practice yoga late after a lumbago. I was not particularly flexible and certainly not strong and in fact in poor health because of a very bad lifestyle. In a few years, I changed my life, my way of life. It all started studying ayurveda and massage in north kerala. During my travels in India I discovered this practice and I had been regularly massaged in Paris for years. I wanted to learn and having learned I wanted to become a practitioner, to care for others. As soon as I completed my certifying training, I immediately started my ayurvedic masseur activity in Paris. I found my clientele, mostly male, looking for authentic quality care and it allowed me to leave the business world and to devote myself fully to the care of others. Wishing to deepen my practice and my understanding of yoga I did my first TTC (teacher training) in Rishikesh, the cradle of Yoga. This allowed me to begin to understand this practice, its multiple dimensions and facets. Yoga being based on experience I continued to advance in my practice and lifestyle changes were made naturally. I started to share what I knew, to advise people but I was not teaching yet, I was not ready. I continued my journey, my experience, my own way of practice. I wanted to know more about meditation, I learned a little, the Vipassana was on everyone's lips, I was a little afraid to block the world and others off for 10 days but I started and I tried. The 3rd day I decided that it did not suit me, the morning of the 4th day I left the center. I could not stop the world like this and only do this introspection. For now I preferred to meditate with open eyes on the world, be in action and interact with the world, people and India who took more and more space in my life. I then met Beatrice Millerand, the daughter of Yvonne Millerand who had been taught by Sri Tirumalai Krischnamacharya, a highly individualized practice based on depth, sensation and breathing base. I followed Beatrice's teachings and discovered the Pranayama and a postural work of sensations and coherence with the breathing, I progressed a lot at her side. In parallel, I studied this master of yoga, father of modern yoga and discovered the importance of philosophy, songs, his devotion. I began to understand the different currents that exist in yoga even though I remained for the moment confined to my traditional Hatha Yoga practice. Wishing to open to various currents and practices of yoga and to learn a meditation technique of Hatha Yoga. So I decided to register and participate in the Rishikesh International Yoga Festival organized by Parmath Niketan, and continue with a Kriya Yoga training with Mataji. It was a unique opportunity to test diverse and varied practices, to listen to preachers and gurus of all lineages. It was thanks to this event that I had the confirmation that I was not a big fan of preachers and Gurus who tend to want to create an addiction, which, at my level of understanding, goes against the very principles of Yoga. This is where I met Vandana Shiva and Mataji, two exceptional women who live their yoga fully, one in ecological action and the other in singing, devotion. It was with Mataji that I followed up with the formation of Kriya Yoga, a method of preparation for meditation. 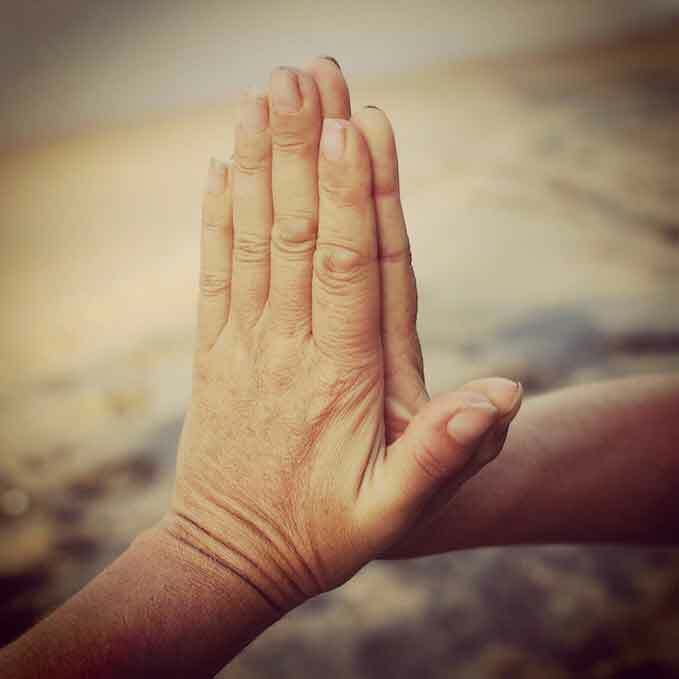 This technique allowed me to fully open up and better control the energy dimension of my body, to work with the mudras and discover their intensity. It was a true spiritual revelation, an awakening. To understand and help me after this awakening I went to the Vedantic center of Gretz and I spent a few moments there. Here I heard the teachings of Vivekananda's Vedanta and discovered Ramakhrisna. It was time for me to start again at the beginning, to restore order in everything I had experienced and learned over the last 4 years. So I did my second yoga teacher training in Rishikesh. During this second training, which followed the same curriculum as the first one, I was able to concentrate more on the philosophical dimension and extracts of the founding texts that are the sutrats of Patanjali and the Bhagavad Gitta. I of course learned a lot about postural work, corrections and adjustments. I was now ready to teach starting my school, my lineage. I am a gay man, my practice is turned to my nature, so I specialized in yoga for men and more specifically naturist yoga for men. My approach is global, holistic, a natural approach, a naked approach. I am a yoga practitioner who tries to follow an authentic journey, yoga as a way of life. I am constantly learning and what I receive I take pleasure to share it, to teach it. By getting closer to my nature, I discovered the naturist practice. It is first of all to give oneself a freedom of movement, a proximity of the body without any filter, a real detachment. By this approach I feel completely consistent with yoga which by its essence must be a connection with its true nature. My yoga classes are yoga classes for men, naked men, naturist yoga classes. By studying the origins of yoga and the various practices, one discovers numerous groups of naturist practitioners such as Nagas sadhus, some Tantric and some Jain monks, the spiritual dimension of the naked practice exists. Practice in an exclusively male environment in all its consistency, because without refusing to practice with women, it is clear that our physical differences exist and our predispositions in the postures also. It is therefore natural to propose postures, paths that are adapted to our physiognomy, to our nature. The practice for man finds all its coherence. I can, in my classes, focus on a yoga adapted for the man, a yoga adapted to my pupils. The practice of yoga goes beyond the asanas and the physical dimension of the practice, but it is just as centered around the body and this physical dimension. This base must be worked, oiled, stretched, reinforced. He must be able to support us in our daily life, in our journey and help us in our static practice so that we can find our balance and our harmony. My studies continued with the study of texts, the sutrats of Patanjali and the Bhagavad Gitta and the writings of Mircea Eliade. I read and re-read these texts and at each reading new dimensions of understanding open up to me. Sidharta Khrisna opened up the pages and texts of the Upanishads that I am just beginning to discover and understand. I have before me years of studies and discoveries. In Paris, I follow the teachings of Peter Goss in Paris since 2014 and other Yoga teachers Iyengar. In India, in 2015 I passed the door of the Omkarananda Ashram, the Iyengar center of Usha Devi, a reference of the Iyengar Yoga known for its extreme rigor. I keep coming here as well for beginner, advanced and intensive courses. My spiritual and philosophical teaching is gaining more and more importance, mainly at the Omkarananda Center where everything is Astanga Yoga of Patanjali whether in the postural courses of Usha Devi or the philosophical teachings of his son Siddartha Khrisna.